PHOENIX —This week a group of bipartisan legislators introduced HB 2586, which would extend Arizona’s current non-discrimination protections to gay and transgender Arizonans in employment, housing and public accommodations. This is the first time a LGBTQ inclusive non-discrimination bill has had bipartisan support at the Arizona Legislature. The bill is sponsored by Representative Daniel Hernandez (D, LD 2), and co-sponsored by Representative César Chávez (D, LD 29), Representative Tony Navarette (D, LD 30), and Senator Kate Brophy McGee (R, LD 28). Currently, five municipalities have ordinances that ban discrimination based on sexual orientation and gender identity. However, Arizona has no statewide laws that protect gay and transgender individuals from being fired, denied housing or refused service simply for being gay or transgender. “Inclusion is not just good for LGBTQ Arizonans, but for all Arizonans. Being inclusive contributes to our economic sustainability and our ability to attract and retain top talent and business. It also happens to be the right thing to,” said Representative Hernandez. “The principles of non-discrimination are rooted in core conservative values of fairness, equality, and opportunity. If we want to live in a state that grows by attracting the very best talent, has a strong economy, is a vibrant place to live, then we must be for business to everyone,” said Senator Brophy McGee. The business community is strongly in favor of the legislation. 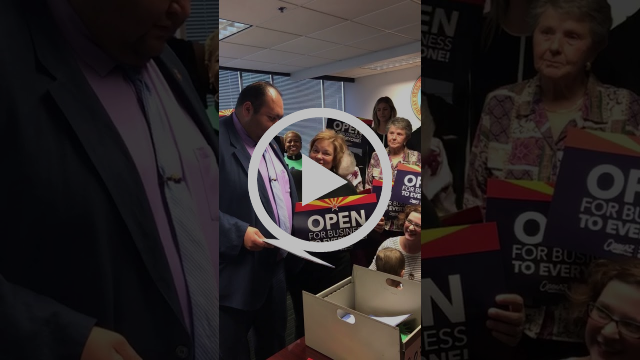 More than 2,600 businesses in Arizona have already voiced their support for LGBTQ inclusive non-discrimination by signing the UNITY Pledge. Further, 88% of Arizona’s top 50 employers include sexual orientation and gender identity in their non-discrimination policies. And it’s not just Arizona. Businesses across the country are increasingly considering non-discrimination protections when deciding where to do business. In the last two years, both CNBC and Forbes Magazine have added LGBTQ rights as priority criteria in their annual best states for business lists. And national organizations like the NCAA announced that they will consider LGBTQ rights when awarding cities with championship games going forward. Faith leaders are also supporting the measure, "My faith teaches us that we are all God's children, and that we should treat others the way we want to be treated. The legislation will simply update Arizona's existing laws to ensure that our LGBTQ citizens are all treated equally and fairly," Reverend Troy Mendez, Dean of Trinity Cathedral added.